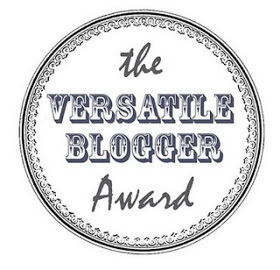 I have been nominated by the lovely Beauty4Free2U.com for The Versatile Blogger Award! I had never actually heard of this award before this, so thank you! Its really nice to know that somebody likes the work you produce, it makes everything so worthwhile! Please go and check out her wonderful blog! 1.) I go to an all- girls grammar school, where I'm currently taking 12 GCSEs! 2.) I live with my mum, little sister and dog. 3.) My favourite magazine is GRAZIA. 4.) This summer I had work experience at The Sunday Times where I helped with Style magazine- it was the coolest experience! 7.) I was part of the Comenius project and I visited Denmark for 9 days with a group from my school (without my mum, which was scary!) when I was 13 and it was one of the best experiences of my life! I'm going to Spain on a trip with school soon too! Well wasn't that fun! Now to tag 15 deserving bloggers! Please send me your links when you've written a post like this, I would love to check it out! aw thankyou so much lovely! Thank you so much for playing along! Sweet answers also! Want to follow each other on bloglovin?